Last June I blogged about my desire to read more hopeful science fiction. Since then I’ve talked about Woman on the Edge of Time, The Lovely Bones and Semiosis. Today I’m back with another recommendation for hopeful sci-fi, and this time it’s a film! If you have recommendations for future instalments of this series, I’d sure like to hear them. Leave a comment below or send me message about it on Twitter. Astraea is a 2016 film that is set in a slightly futuristic version of what used to be the United States. The main character, Astraea, is a young girl living in what’s left of human society after an epidemic killed off a huge percentage of the population. She’s convinced that their brother and grandmother are still alive, and tries to convince her older half-brother, Matthew, to travel around North America in search of them. Unlike a lot of post-apocalyptic societies, this one is pretty peaceful world. The human population is so small that it’s rare to run across another person in general, much less one who might have bad intentions. I’ve reviewed several science fiction and fantasy movies for this site so far. This is the first truly hopeful one I’ve come across, so I thought I’d add it to the Hopeful Science Fiction reading (and now watching) list instead of writing a regular review for it. Unfortunately, I wasn’t able to find photos of all of the characters like I normally do. This was an Indie film, so I’m guessing their fan base wasn’t large enough for them to have the resources or time to commit to such a thing. I was able to find photos of the two main characters, though, which is the most important thing. Astraea is the protagonist, a teenage girl who may or may not have telepathic abilities. 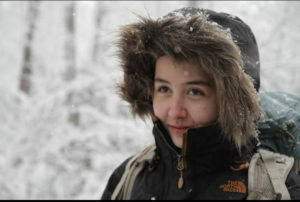 By the time she and her brother begin travelling to find their parents, there are very few living people left in North America. They spend the majority of their time with no company other than each other. Matthew is Astraea’s older brother. He is fiercely protective of his little sister. While he has doubts about whether or not their journey to find possible surviving relatives is a smart idea, he’s determined to travel with her and keep both of them safe. 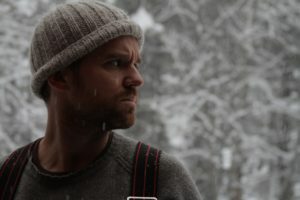 James is one of the few survivors of this plague that Astraea and Matthew met while travelling.After a tense misunderstanding during their first meeting, James and his wife, Callie, agree to give Astraea and Matthew food and shelter over the winter. The first thing that struck me about this film was how ordinary life was for the characters despite the fact that they were technically living in a post-apocalyptic world. Their days were filled with going on food runs at the nearest grocery store, doing the occasional bit of hunting, keeping the fireplace burning, and finding ways to amuse themselves when those basic chores were finished. Their story happened during the winter, so their to-do lists were much shorter than they would be if the characters also needed to plant a garden or preserve food. Honestly, I actually found the storytelling a little slow at times. It felt a lot like how real life unfolds. Most days are fairly ordinary and peaceful. Occasionally, someone might get into an accident, have an argument, or need medical treatment, but that is by the exception to the rule and it is always punctuated by other people doing everything they can to help. This isn’t to say that the characters lived in perfect harmony all of the time. They had disagreements like any group of people living together are bound to do, but that was as far as the conflict went. Unlike violent shows like The Walking Dead, there were no roving bands of humans waiting to hurt the innocent folks they met on the road. The survivors were simply trying to stay alive through the winter. Speaking of innocence, I was pleasantly surprised by how well all of the adults in Astraea’s life were able to protect her. She was seen as the child she was, and there was always someone around to make sure she had a nutritious meal to eat and a safe place to sleep. That isn’t common in this genre at all, and I found it refreshing. It wasn’t until I’d finished the scene that I looked up her name and realized that it is also the name of the Greek goddess of innocence. I’m sure the filmmakers did that on purpose. It was a wonderful reference that I’m glad I took the time to google. All of the characters in this story lost people they loved in and shortly after the epidemic, so there were references to their deaths sprinkled in with the happier scenes. I appreciated the fact that the storytellers mixed these emotions together. There is hope after grief. You can miss someone who died recently or a long time ago and still find a reason to believe that tomorrow will be a brighter day. In my quest to find hopeful science fiction, I keep circling back to stories that acknowledge the pain people experience during the course of a lifetime. There’s something immensely appealing to me about this sturdy kind of hope that thrives in difficult circumstances. If you feel the same way, I highly recommend checking out this film. 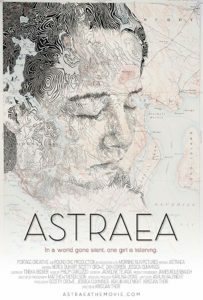 Astraea is available on iTunes and Amazon Prime Video. Last June I blogged about my desire to read more hopeful science fiction. Since then I’ve talked about Woman on the Edge of Time and The Lovely Bones. Today I’m back with another suggestion. 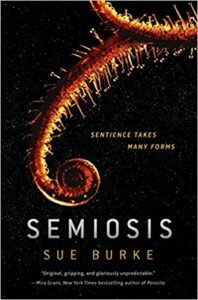 Sue Burke’s Semiosis is a 2018 hard science fiction novel about colonists from Earth who travel to a distant planet in hope of making it their permanent home. The storyline followed the original group of explorers as well as their descendants for several generations. They knew almost nothing about the planet they named Pax before they arrived there, so preparing in advance for what they were about to experience wasn’t easy. Nearly every chapter in this book showed how the most recent generation in this timeline adapted to the many challenges they faced while attempting to survive on a planet where RNA, not DNA, was the building block of life. Generally, one chapter was assigned to each new generation as they came of age and began making decisions for their community. Th experiences of the first generation were promising. The land was covered in vegetation, much of which their scans showed was safe and nutritious for humans. They quickly began attempting to build shelters and adjust to the many differences that came with living in such an alien environment. As you might have already guessed, this was a plot-based novel. Since each section more or less introduced an entirely new cast of characters (based on how many members of the previous generation had managed to live to see old age), there wasn’t a great deal of time for any one character to steal the spotlight. I normally have a strong preference for character-based stories, so I did need some time to adjust to the fact that I would only have a short amount of time with any of the fascinating people I met as one generation was slowly replaced by the next. Given how long it took the original group of immigrants to realize that many of their assumptions about what life on a distant plant would be like were completely wrong, it made sense for the whole adventure to unfold slowly over the courses of multiple lifetimes as new generations built on the knowledge their parents and grandparents had painstakingly put together. No individual human could ever live long enough to gather all of the clues they did over such a long period of time. However, I would have liked to see more continuity between the generations. I understood why the lifespans were shorter for humans, especially in the beginning, but I spent so little time with the many characters that I didn’t feel like I bonded with any of them. They were there in one scene and then sometimes gone in the next. There are many details about the plot that I can’t share with you without giving away huge spoilers. Needless to say, the characters in this book were surprised over and over again by what life was really like on their new home in just about every way you can imagine. The food obviously didn’t taste anything like food does on Earth. Calibrating what was and wasn’t dangerous on this planet was hard for them, too, as well due to how little they knew about life on it ahead of it. All of their previous training was useful, but it couldn’t have possibly prepared them for everything they were about to experience. They had no way to contact Earth, leave Pax, or receive any additional supplies, so they had to figure out ways to keep going no matter what happened to them. The first generation had some really rough experiences due to a string of bad luck and not having the right types of supplies at critical moments. It wasn’t all doom and gloom, though. There were conversations about ordinary things like unpacking the ship or how to decide when to switch from the food they brought with them to scavenging for a fresh dinner. I especially loved the characters’ contagious excitement at finally getting to explore the land without having any idea what they might find there. Mixing those moments of grief in with all of the other emotions they experienced was a nice touch. It reminded me a lot of what happens in real life when someone is dealing with a difficult problem but also still has to do totally mundane things like sweep their floor, plan dinner, or take their pet for a walk. Life is hard sometimes, but it still goes on. This feeling returned once they realized there was an intelligent life form on that planet that all of their previous scans of it had failed to pick up. I couldn’t stop reading once I reached this section, and it only got better from there. There are two reasons why I’m recommending this as a hopeful science fiction read. Number one, we’ve all had days that were so frustrating or painful they felt like they’d never end. This book could describe a day like that and then zoom out and see how that experience mattered (or didn’t matter) in the longterm. There were questions asked early on that didn’t receive answers until decades or even generations later. There’s something comforting in seeing that pattern play out over and over again. What doesn’t make sense to us now might make sense years from now. Alternatively, it might fade away and not be meaningful at all after enough time has passed. Number two, things did improve for the characters over time. The tragedies they experienced were real, but so was the hope they found as they adjusted to the challenges they faced and figured out how to look after themselves long after all of their Earth supplies had run out. What hopeful science fiction stories have you been reading recently? This past June I blogged about my desire to read more hopeful science fiction. Last month I reviewed Woman on the Edge of Time as my first selection for this list. Today I’m back with a review of Alice Sebold’s The Lovely Bones. As I mentioned last month, the books I include in this series don’t have to start off in a hopeful place, and I don’t require them to shy away from difficult topics. I’m including a trigger warning for today’s review because The Lovely Bones does begin with a teenage girl being raped and murdered by someone who lived in her neighbourhood. The story briefly discussed the end of this character’s life without going into any graphic details about it, and I will be talking about it even less than the narrator did. However, I want everyone who reads the rest of this post or check outs this book for themselves to be fully aware of those potentially upsetting references ahead of time. 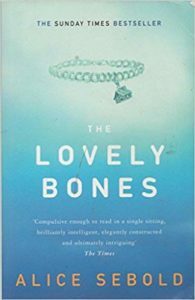 Alice Sebold’s The Lovely Bones was first published in 2002. The story it told began in the 1970s with the disappearance and violent death of the protagonist, a fourteen-year-old girl named Susie. Her parents and siblings struggled to move on with their lives without knowing for sure what had happened to her, and the main character found it equally difficult to say goodbye to a life that had only just begun for her. Interestingly enough, the plot had much less to do with how Susie died than what she decided to do with her time after her death. The afterlife Susie was welcomed into was everything anyone could hope for. There were no harsh judgements awaiting her or anything like that. She was loved, cared for, and reassured in a safe, happy place as she adjusted to the thought of a future she could have never predicted ahead of time. Yet she still wanted to return to the life she’d once had. This yearning that Susie felt to reconnect with her loved ones was overwhelming at times, and it made her an incredibly sympathetic character. Anyone would have felt the same way in her shoes. I wanted her to find a way back home more than anything, but I couldn’t imagine how the plot could ever bend in that direction. One of the things I wish I could change about western culture is the way it reacts to grief. There’s an expectation in many western societies that one should grieve quietly, briefly, and in private. I’d like to make it clear that there’s nothing wrong with this kind of grief, but it’s not the only way to respond to loss. The Lovely Bones showed characters who grieved in many different ways. Some of them spent years trying to figure out what happened to Susie. Others moved as far away from the town where Susie had lived as they possibly could or buried themselves in various projects as a way to cope with the past. Even Susie herself had to figure out how to say goodbye to the life she expected to have so she could embrace the (after)life she was experiencing instead. There’s no shortcut through grief. As hard as it was at times to watch the characters mourn everything they’d lost, I appreciated their realistic responses to the days, weeks, months, years, and decades that followed after the heartbreaking opening scene. These were some of the best portions of the book. I’m not embarrassed to admit that they occasionally brought a tear to my eye. Pain is unfortunately a part of life for every living thing. While some know more of it than others do, no one that I’ve ever met has been able to escape it entirely. What The Lovely Bones did exceptionally well was to show how someone can accept what has happened to them without anyone making excuses for the perpetrators or calling those experiences good ones by any stretch of the imagination. It’s been my experience that some well-meaning people will do both of those things in an attempt to help the person who was hurt begin to heal. They almost always have no idea they’re actually making the problem worse, but it was still refreshing to read about characters who tried to find acceptance without downplaying what happened or pretending like it had some mystical or uplifting purpose that Susie needed to discover in order to move on with her (after)life. One of the few criticisms I have of this tale has to do with Susie’s multiple attempts to accept what had happened to her. The plot went into a lot of detail about her resistance to this idea early on, but it wasn’t quite as thorough in later chapters once her siblings grew up and began to find their own sense of peace. I can’t say much else about this without giving away spoilers, but the ending would have been even better if the audience could have seen more examples of Susie’s later reactions to this topic. The hope in this story arrived gradually. Don’t look too hard for it in the first few scenes or chapters. Just like what often happens in real life, it will take time for everyone to adjust to their new reality and for certain parts of the plot to be set into motion before you begin to realize what will await Susie and everyone who loved her. To see the true effects of hope over a long period of time, one often has to look at the longterm evolution of a person, memory, idea, or wish. What will happen to this individual in ten years? How does someone live with decades of unanswered questions? What might be waiting for you on the other side of unimaginable grief? 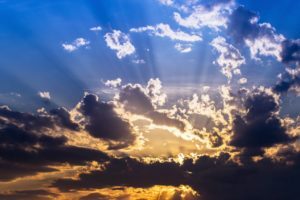 The beauty of this tale comes in how it defines and describes this concept for people who aren’t interested in pat answers or ignoring the types of pain that make hope so meaningful for those who seek it. Last month, I blogged about my desire to step back from the dystopian genre and read hopeful science fiction instead. The rules were simple. I didn’t require a story to start out in a hopeful or happy place, but I did want to read scifi that ended that way. Since then, I’ve started to compile a list of books that fit this description. I’ll be talking about one of them today and plan to gradually blog about the rest in the future. If you have recommendations for this series, I’d sure like to hear them. Leave a comment below or send me message about it on Twitter. 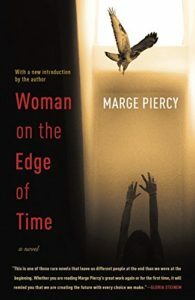 Marge Piercy’s Woman on the Edge of Time was first published in 1976. It was about Consuelo Ramos, a woman whose life had been forever changed by poverty, mental illness, prejudice, and violence. Nothing I’m about to say is a spoiler. All of it was mentioned in the blurb for this book, and there are many plots twists and important details from later chapters that I’ll leave up to you to discover for yourselves. I should warn you that the beginning of this book was filled with a great deal of pain. Consuelo’s life had been incredibly difficult for many years before the audience met her. She’d made choices that seriously harmed other people, and she’d been on the receiving end of other people’s terrible decisions as well. There were times when it read much more like a dystopia than anything else before the plot veered into other directions. If you press forward through the dark beginning, though, you’ll begin to see what I’m talking about when I refer to this as a piece of hopeful science fiction. Shortly before involuntarily committed to a psychiatric hospital early on in this story, Consuelo began telepathically communicating with Luciente, a person who was living in an utopian society in 2137. As their unlikely friendship blossomed, Consuelo eventually travelled through time to visit Luciente and see how people lived in the 2100s. It was like nothing Consuelo had ever seen before. In Luciente’s world, there was no poverty, racism, sexism, or violence. No one ever went hungry or was denied urgent medical treatment due to their lack of ability to pay for it. Everyone was given the opportunity to chart the course of their own lives regardless of who they were or what they’d previously decided to do with their energy and time. 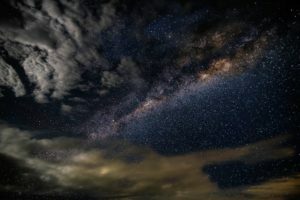 As long as it didn’t harm anyone else, you could do virtually anything you desired with your time, from raising a family to making art to experimenting with new ways of growing crops. This wasn’t the only future world Consuelo visited, however. She later saw a dystopian society where the bodies and minds of poor people were used as a commodity by the wealthy. It was the opposite of the place Luciente lived in every way you could imagine. Roles were rigidly determined by who your parents were, and there was no way to switch from one part of that society to another. A person’s time was never their own. There was always someone looking over your shoulder and telling you what you must do next. Which Future Will Be Ours? One of the things I enjoyed the most about this tale was how much time it spent explaining why Consuelo had been chosen to see and interact with these two very different versions of the future of humanity. She wasn’t a passive player in these trips by any means. Her presence made a difference in ways she couldn’t even begin to imagine so long as she was stuck in the psychiatric facility. As Luciente would tell her over and over again, the decisions Consuelo made in 1976 were going to play a critical role in which version of the future came to pass. The thought of someone as socially marginalized and powerless as Consuelo actually being the key to changing the fate of the entire world tickled my imagination. I’ve almost never seen anything like it before. Most science fiction and fantasy heroes that I’ve read about have had at least a few advantages in life, whether it’s through being born with special powers or being apprenticed to someone who could teach them the skills they needed to defeat even their most powerful enemies. The fact that Consuelo was expected to save the world without any magical abilities, mystical objects, all-knowing mentors, trusty sidekicks, or any other real sources of help in her battle made it impossible for me to stop reading. I had to know which version of the future would come to pass and if Consuelo would be able to improve the circumstances of her own life in the 1970s as well. With apologies to Emily Dickinson, I loved this story’s approach to the concept of hope. When I first began researching possibilities for this series, I wondered how easy it would be to find hopeful examples in a genre that has so often assumed the worst case scenario is the one worth writing and thinking about. The dystopian sub-genre has become so popular these days that I knew I’d have to do some digging to find characters who didn’t live in that kind of world. Since I’m also not the kind of reader who usually seeks out tales that attempt to be hopeful by brushing over – or even simply ignoring- difficult topics like racism and sexism, my other concern was that I’d be left with stories that were hopeful only for readers who were able to suspend their disbelief and enter an imaginary world where no one ever dealt with serious, real world issues. The beautiful thing about Woman on the Edge of Time was how it found hope even in the midst of all of the prejudice Consuelo fought against during her life. Her determination to radically improve the future for the sake of every person who had been or will be born was rooted in part in her hope that all forms of bigotry could be vanquished for good if she made the right decisions. There are so many other things I want to say about this book, but I don’t want to give away spoilers about it for anyone who hasn’t read it before. If you have read it, I’d be happy to discuss it in much greater detail somewhere other than the comment section of this post. Do keep in mind that this tale has many twists and turns along the way to the final scene. It’s not something I’d recommend to anyone who needs to avoid any references at all to complex topics like abuse or how destructive habits can be passed down from one generation to the next. Consuelo and many of the other characters had many difficult experiences in their lives. This wasn’t the sort of universe where someone swoops in and saves the good guys in the nick of time before anything terrible happened to them. These characters knew more than their fair share of pain, but all of the hope they found along the way more than made up for it in my mind.